Low water levels on the Rhine River have resulted in transportation disruptions for shipments of petroleum products by barge, which in turn have resulted in record supply disruptions in markets upriver, such as Switzerland and southern Germany, and high stock levels downriver, in the Netherlands and Belgium. The Rhine River, which runs northwest from the Swiss Alps through Switzerland, Germany, France, and the Netherlands, where it flows into the North Sea, is a major petroleum product transportation corridor. 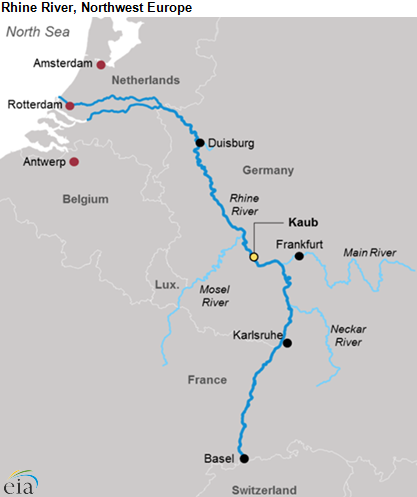 The navigable portions of the river connect the major refinery and petroleum trading centers of Amsterdam and Rotterdam in the Netherlands and Antwerp in Belgium, collectively known as the ARA, to inland markets. Tanker barges carry petroleum products from the ARA upriver to inland bulk distribution terminals that provide petroleum products to nearby areas. Water levels on the Rhine River fluctuate with the seasonal rainfall, and both high and low water levels can create problems for barges. High water levels on the Rhine may put barges at risk of potentially striking bridges over the river. Low water levels mean barges risk getting stuck and hitting the river bottom. Within safety and operational constraints, barges adjust the amount of cargo they carry to balance bridge clearance and deep draft restrictions based on the water level. Low water levels mean barges must carry less cargo, increasing the freight rate per unit of cargo. 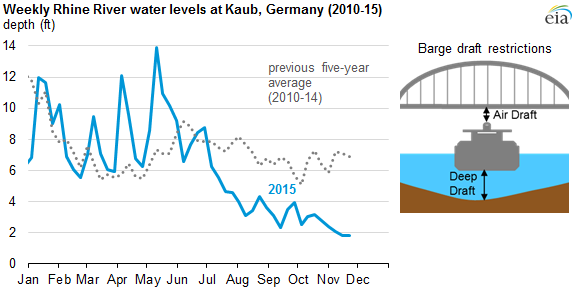 In recent months, water levels on the Rhine River measured at Kaub, Germany, near the Rhine's midway point, have been at historic lows. The average water level at Kaub in October was 2.8 feet, compared to the five-year average levels of nearly twice that (five to seven feet). Low water levels on the Rhine since July have resulted in increased barge freight rates, with the estimated rate for a cargo of distillate fuel (heating oil or diesel) from Rotterdam, Netherlands, to Basel, Switzerland, increasing from around $5 per barrel (b) in July to more than $30/b in late October. Rates have also increased for delivery to points closer to the ARA, with delivery to Frankfurt, Germany, now more than $10/b, compared with $2/b in July. The low water levels have resulted in tight supplies in markets farther upriver, such as Switzerland. On October 28, the Swiss Federal Office for National Economic Supply permitted the release of emergency fuel reserves following problems at the nation's only refinery and the continued disruption to Rhine River shipments. Alternatives to shipments on the Rhine River are costly, as Europe's petroleum product pipeline infrastructure is not as extensive as in the United States, leaving relatively more expensive transport by rail and long-distance trucking as the remaining alternatives. These disruptions come at a time of year when markets upriver of the ARA begin to build stocks of heating oil for the winter. Normally, stocks of distillate fuel would be transported from refineries and terminals in the ARA region upriver on the Rhine, but the low water levels and high transportation costs are causing distillate stocks to remain in the ARA. After high refinery runs this summer, independently held distillate stocks in the ARA in October averaged 10 million barrels above their five-year average level. Weather patterns will determine the duration and severity of the disruption. More precipitation in the Alps will flow water in the tributaries of the Rhine River, raising the water level downstream. Warmer-than-normal temperatures in the Rhine River valley could reduce heating oil demand. Drier and/or colder weather could have the opposite effects.